When considering the future of the page as I haven’t experienced many ebooks- especially innovative or unique ones- what first came to mind were apps. Apps are continuously being invented and their immense numbers require the apps to be innovative or exciting to capture user attention. One app in particular that I will be discussing is the Uber app. 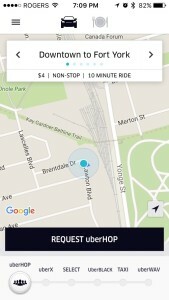 When the user opens the Uber app an interactive map appears which tracks the user’s location through GPS. The user is able to request a pick up and drop off location after selecting the type of car or the user may select Uber eats which delivers take out. The user is then billed directly through the app. When reading Peter Stoicheff and Andrew Taylor’s article (2004), “Introduction to The Future of the Page” several interesting points of the components of a page that are similarly reflected in the Uber app.The article states that the page became the most important place for displaying information and determined intellectual authority, logical arguments and useful information (Stoicheff, & Taylor, 2004). Cell phones and iPads have become so much a part of our everyday and for many the main source of news and communication it can be argued that they have achieved the same attributes. 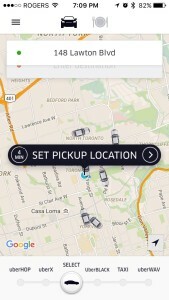 The Uber app for many is a regular source of transportation and a very useful tool. Their article also states that the rectangular shape, format and layout of the page has become so familiar to us that we do not even notice it (Stoicheff, & Taylor, 2004). I believe that this can be applied further to applications on a cell phone or iPad whose screens are so familiar we have begun to not notice their format and even the layout of most cell phones follows that same rectangular shape. Stoicheff and Andrew (2004) reflect that the book is never fully encountered except as an expectation, recollection or when closed. The same can be said for the Uber app. The user can only be experienced one page at a time and the user may never see the backend of the program. While it may be argued that the architecture of the page has not changed significantly since it’s early years, I believe this has shifted with the creation of the digital page. As stated by Stoicheff and Andrew (2004), “the advent of the digital page has created a writing space of tremendous flexibility and ease of use”. The Uber app demonstrates flexibility with it’s interactive, non- static nature and by displaying live maps along with text. Stoicheff, Peter and Andrew Taylor. Introduction to The Future of the Page. University of Toronto Press, 2004. 3-25.